Jade's journey with CDKL5: We're baaacckk!! 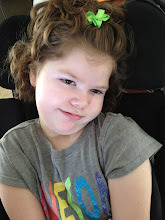 Her seizures are virtually unchanged. We go to see her Ketogenic team next Tuesday. I think I will persuade them to lower her Keppra dose to what it was a month ago. The increase has done absolutely nothing for her, so why bother? After reading most of the comments posted about the CDKL5 kids, it's very tempting to reduce all of her meds and just go with the Keto diet. We'll see what the good docs think. On the home front, our new puppy should arrive within the next week or so. Wouldn't ya know, one of the names we're kicking around is Guinness :) He's a real cutie though and the kids are so excited for him to join us. Let's hope this time around, we don't have the problems we had with Stryker (who is doing very well by the way).